Motorola surely has an affinity for the strange and unique which is made even more evident with devices like the Motorola BACKFLIP and the upcoming FLIPOUT that's been seen of late. 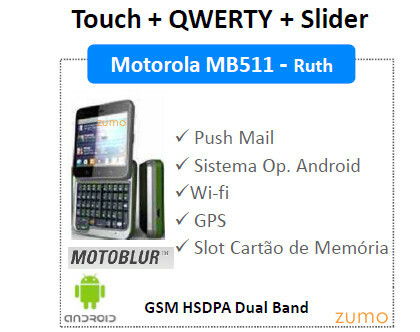 The square like Motorola FLIPOUT was again recently spotted this time around by Brazilian blog Zumo in a leaked presentation slide with the code name “Ruth” attached to it. What's interesting is that we first heard about the Motorola “Ruth” MB511 way back in January, but now we're finally seeing the actual device in question. Although some of the specs that were previously speculated were confirmed this time around, it made some clear hints that the device is expected to launch some time in June. Sure it may cause people to perform a double look due to its square nature, but there is still no word where we will see this smartphone land. This is the MOST wONDERFULLY oRIGNIAL rAVING sTRATEGIC tREMENDOUS Design. ever.